PALM BEACH, Fla. – April 11, 2019 – Barrett-Jackson will light up the auction block with eclectic, rare automobilia pieces, including the final segment of the William K. Haines Collection, during the 17th Annual Palm Beach Auction from April 11-13, 2019, at the South Florida Fairgrounds. Barrett-Jackson began selling authentic automobilia in 2002, and it has since grown into a highly anticipated part of each Barrett-Jackson auction. 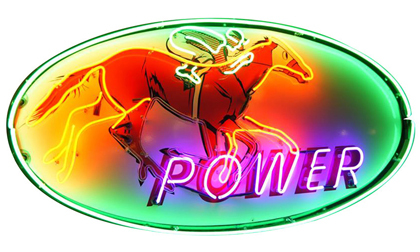 Over 300 automobilia pieces will cross the block in Palm Beach at No Reserve, led by a rare 1950s Gibble Oil “Power” Gasoline neon porcelain service station sign with galloping racehorse graphics (Lot # 5997). Genuine, authentic gas pumps are expected to be among the most anticipated automobilia pieces crossing the block in Palm Beach. A collection of over 17 perfectly restored examples dating from the 1920s through the late 1950s will include several hard-to-find Brass Era visible gas pumps, including a distinctive 1928 Standard Oil Gold Crown Gasoline restored Wayne model #515 example (Lot #5990.1). An exquisite 1931 Richfield Oil Butler #30 restored 10-gallon visible pump (Lot #5886) is another incredible souvenir from the Brass Era. Also highlighting the automobilia offering is a 1930s Polly Oil Fuel Island (Lot #5984.1) restored by McLaren Classic Restorations, which includes a 1933-37 Tokheim 870 clock-face gas pump, vintage trash can, Eco Air meter and gas station attendant. The three beautifully restored 1970s-era Honda mini-bikes being offered at No Reserve include (Lot #5971), a 1970 Candy Sapphire Blue Honda CT70 KO and (Lot #5874.1), a concours-restored 1971 Candy Sapphire Blue and white Honda Z50 K2. The third Honda mini-bike crossing the block is an original 1970 Candy Apple Red Honda CT70 (Lot #5971.1) that has been completely redone. Genuine neon signs will also light up the auction block in Palm Beach, including a clean 1940s Cadillac Standard Of The World neon porcelain dealership sign with a Cadillac crest logo (Lot #5996). One of the most fun neon signs of its time period is a 1950s Dog N Suds drive-in single-sided neon porcelain sign with wonderful graphics and animated neon (Lot #5998). Click here to view the complete 2019 Palm Beach Automobilia Auction docket. For more information on becoming a bidder for the 2019 Palm Beach Auction, follow the link to www.Barrett-Jackson.com/bid. Bidders registered to purchase vehicles are automatically enrolled to bid on Automobilia with no additional registration fee.